There are two definitions for the French word, “caviste”. The first is the enological one in that it is the person in charge of the cellar. The second would be easy to translate simply as “wine shopkeeper” but that wouldn’t really be giving the profession its due as Parisians (and undoubtedly the rest of the French) believe that, much like a reliable doctor, once you find a caviste that understands you, you keep them for life. This is an aspect to wine that is lost in a great deal of the world and especially in the US where it seems most people feel that they can find their wines just fine on their own, and that the Robert Parkers and [shudder] James Sucklings have supplanted the caviste. The beauty of the caviste profession is that they not only provide you with your go-to tipple, but also expose you to new wines that you might not have thought to try or don’t have the means to try as these people are invited by the wine industry all over the world to learn about their wines and regions. 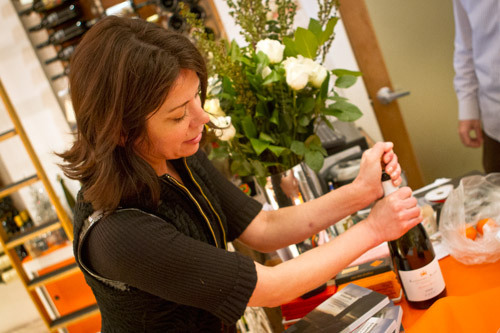 While living in San Francisco, we were fortunate to have a reliable caviste in the form of Ceri Smith (pictured above) with her lovely neighborhood shop, Biondivino. Ceri knew what we liked and could help us find it at many different price points. While she specializes in Italian wine, she knows about all manner of wines as a whole and continues to be a go-to fount of wine knowledge. We were reminded of Ceri after spending a week in Paris. In Spain, the caviste somewhat exists, but has been largely supplanted by the supermarkets and the almighty Euro in determining what people buy (Don Simon anyone?). But, in Paris, it’s still a thriving and pervasive trade which is also quite essential given that French wine regions make your head spin long before getting anything in your glass. While tempted by the prices at Monoprix, Franprix, and the other supermarkets that offer decent choices near where we were staying by Canal Saint Martin, it was much more pleasant to head to little neighborhood shops like Au Quai on 15 Rue Alibert and La Cave du Daron on 140 Avenue Parmentier. Despite not knowing anything about us, like fortune tellers, they were quite quickly able to deduce what would be a good choice without talking down to us or forcing their tastes upon us and we were wonderfully happy with all the bottles we picked up. Also a wonderful curiosity was the “mobile caviste” who sets up shop at the farmer’s market on Rue Alibert each Sunday. It wasn’t anything fancy, just a guy who rolled up with a truck, put out a selection of bottles and hung up a sign. It was however wonderfully effective and we were quite annoyed that we wouldn’t be around the following Sunday to take advantage of what were some of the best wine picks including our first exposure to a wine made almost fully of Négrette. Of course once heading back to Catalonia, we found our latest box from the online wine club Wineissocial waiting for us. Unlike Lot18 which has had mixed success in the US and UK, Wineissocial has done well in creating a unique platform with wines selected by well-known sommeliers offered up each month in a pack of two to their members. While it doesn’t have the personal touch of the caviste, it does offer a very nice, 21st century option delivered to your home (in Spain anyways) each month. Maybe it’s because the local bartender has supplanted the caviste in many countries, but even just this short exposure made us wish the profession was more prolific like in France. In Spain yes, there have always existed the “cavistes” but they used to sell a bulk wine. Then, they started offering some labelled wine, I remember those days! And now, wirh over 70% of the wine sold in supermarkets showing zero sentiment for wine, there are some franchises selling a,b,c and some independant fighting for surviving but making a great job. Thanks, it’s good to be back. We miss the Catalan wines a great deal, especially after opening a bottle of Mas Mallola from Marco Abella right after being south of the border. You do indeed see some of these wine shop keepers here in Spain, but very, very few are at the caviste level. They mostly just say, “Okay, sure, here’s a wine. It’s good” if they do anything at all and you’re right in that many of them are old a granel shops where it’s mainly old men getting a 5L jug of something cheap. On the flight home I watched an interesting documentary on wine and global warming. One of the people in it was from Barcelona and she was a professional wine taster and guide. She had a “shop” with 3,500 kinds of wine. I did not catch her name, but they actually talked a bit about Priorat, I felt so smug that I knew about this region. You and Elia probably know her, small world.